The past always looks better, particularly when we speak about Formula One. Races seemed to be more exciting, drivers were icons and the whole circus was more glamorous than it is nowadays. Is it really that way? Many things have changed, sure they have, and some even say that it changed for the worse. Obviously, we don’t get to see drivers behaving like James Hunt did back in the day, or hear drivers speaking their minds… it seems as if what Teddy Mayer (McLaren Managing Director) said once: “drivers are just interchangeable light bulbs – you plug them in and they do the job”, has come into reality. In some ways, some of these days’ drivers are just like robots. They are told what to say and what not to. Sponsors concerns and Marketing strategies keep them from behaving natural in case that could make the money go away. Although, amongst this dull as a dishwasher PR we can still see some bright colours. Lotus F1 Team communications are well known and described as witty and daring, and we all remember some of the greatest Kimi’s quotes which were then – cleverly – used as merchandising. However Kimi isn’t the only character the Endstone based team have. I had the chance to meet him at Festival of Speed in Goodwood and although I’m not going to write down everything we spoke or he said or did… that’s part of our own experience; I can say that he made me burst out laughing a few times, and I wasn’t the only one doing so. However he wasn’t trying to be funny and I guess that’s what makes him more special. That’s him. 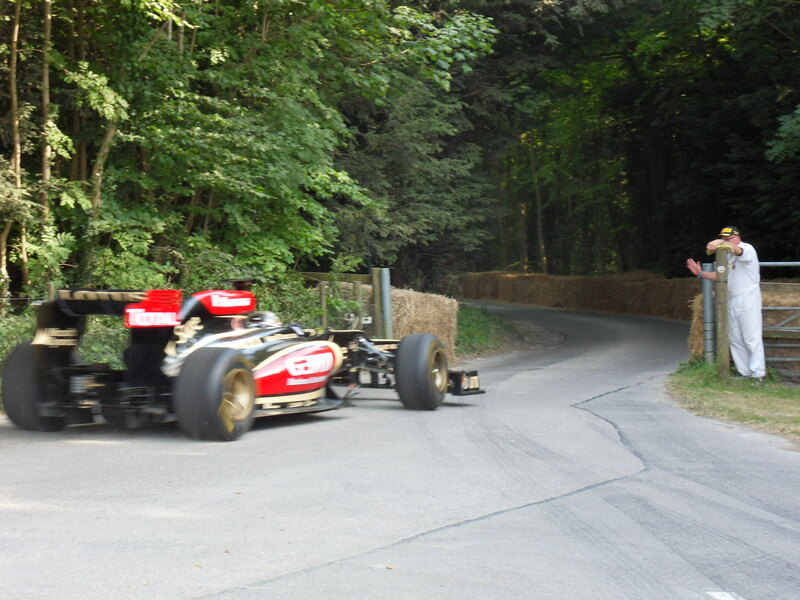 One of the top moments during that weekend at Festival of Speed was Sunday’s modern Formula One’s last run. Everyone is in the paddock waiting for an already 45 minutes delayed run. 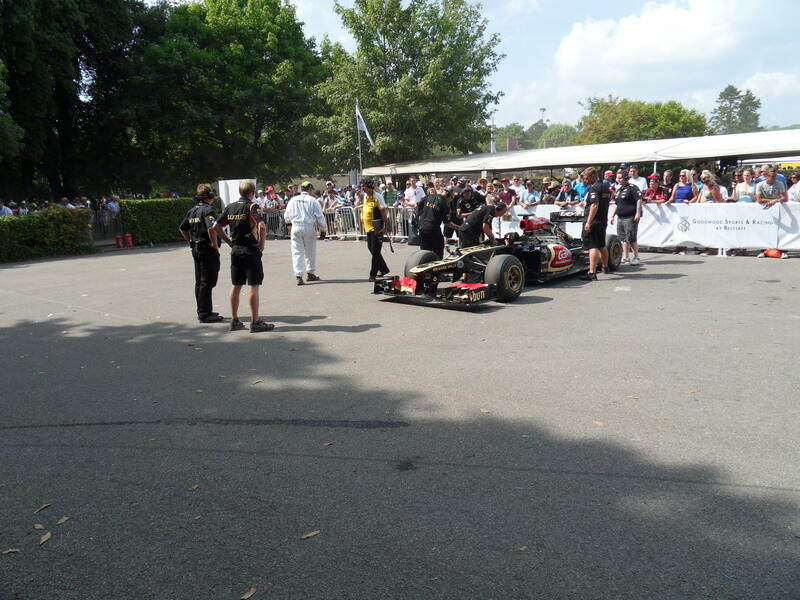 Cars ready, drivers ready… Off they go! 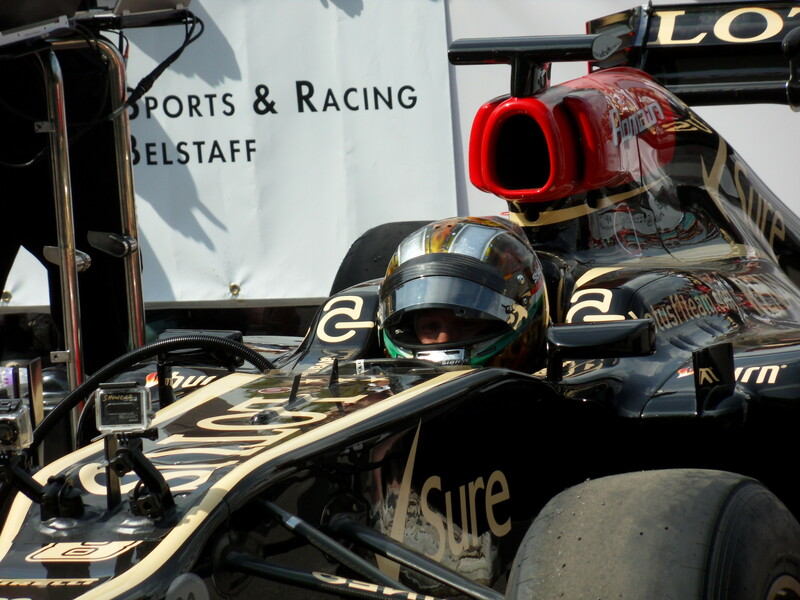 First Marc Gene’s Ferrari, then Nico Rosberg’s Mercedes… Lotus is next, but isn’t moving. Actually the umbrella is still placed where the driver should be. So the rest of the cars go down for their run up the hill. 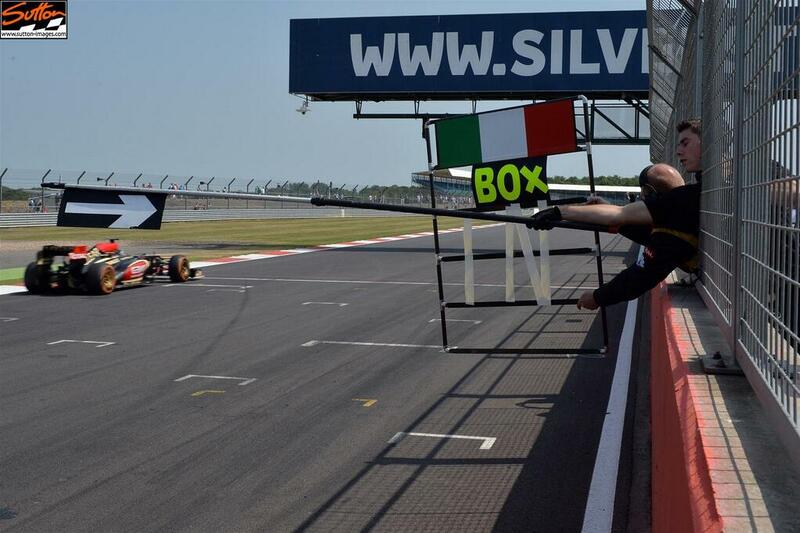 Lotus team looking around for their driver but Davide was nowhere to be seen. Next group of cars start arriving in the paddock. Marshalls decided to move the Lotus out of the way hoping that Valsecchi will arrive and they will be able to let him go in between groups. No sign of Davide whatsoever. Finally, when it seemed like they will have to call it off, he appeared running like a mad thing. 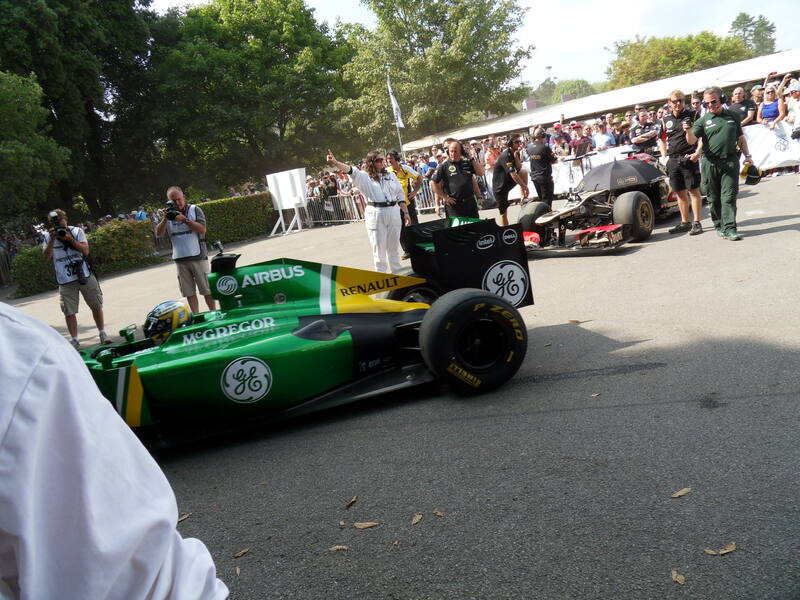 Eventually he got in the car and was able to do his last run – a bit later than expected. The team had told him that there was 45 minutes delay and he decided it was a great moment to go running. A bit of training is always good for a professional driver. Let me tell you that this is about 4 or 5pm on a very hot day in England. He when for a run around the golf course – which I reckon got more than one unhappy look from the golfers – and by the time he heard the sign for his run he was too far, and “even though I ran very fast I couldn’t get on time”. Pure charisma and a completely straightforward guy, that’s Davide Valsecchi. Last winter during the tests in Barcelona, Sergio Lillo (Revista Scratch journalist) interviewed him. I don’t think he will easily forget that interview and process to get it done. But anyway, one of the highlights was the answer the Italian driver gave him after questioned about pay drivers and if any team had asked him for money in order to get a role as a third driver. Valsecchi basically said he didn’t have anything material to offer apart from his Fiat Punto and an apartment, but he was happy to give it away. And then he started laughing. Valsecchi may not be the most popular one… but for sure he is a genuine man and more charismatic than many others in the paddock.